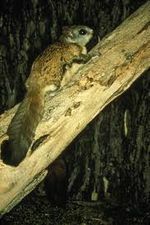 The body of a Tree Squirrel, and Flying Squirrel is designed for life in trees. They have long slender bodies and bushy tails. Tree Squirrels and Flying Squirrels have long and muscular limbs for climbing, but Flying Squirrels have flaps of skin connected to their forefeet that allow them to glide through the air. 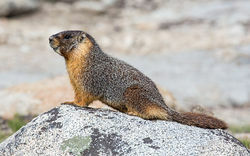 The bodies of Ground Squirrels are designed for life on the ground. They have short legs, and strong paws with claws for digging. The forefeet of squirrels have four long digits and a small thumb, and their hind feet have 5 digits. Claws, are found on all digits, except the thumb; which has a nail. The fur coat density of a squirrel depends on the climate of their habitat; denser fur coat for colder climates, thinner fur coat for warmer climates. 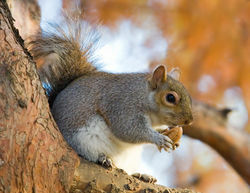 Squirrels vary greatly in size; the smallest being the African Pygmy Squirrel, and the largest being the Oriental Giant Squirrels (Genus Ratufa). They also very in color; some have two basic shades of solid brown or gray, while some have stripes of color on the coat. Some tropical species exhibit combinations of gray, white, maroon, yellow, orange, black, brown and red. The distinguishable characteristic of squirrels is their skull structure and primitive jaw structure. Their skulls are small and short, with a short snout, and an arched skull profile. Squirrels have four large incisors, with enamel that grows continuously throughout the life of the squirrel. Since these teeth are constantly used for gnawing, they are kept short, but the teeth can become a problem for squirrels in captivity. When the kits are born, they have no fur, closed eyes, and closed ears. All kits are born into a nest and live there from 26 days to 42 until they can live independently and are weaned, but development is different for each species. Some squirrels reach sexual maturity by 87 days old, others by the time they are three years old, hibernating squirrels tend to develop faster, and some are born at larger sizes, so the time to independence is much shorter. In some species, the females may aggregate, or come together to take care of the kits, and pass on their territory on to them, which greatly increases survival rate. In the wild, most young squirrels die in the first year of life. Most squirrels have a maximum longevity of 8 to 14 years in the wild, and up to 16 in captivity. Scientists suppose that squirrels evolved around 50 million years ago. However, this estimate was upset by a recent find in China of a gliding squirrel that dated at around 125 million years old. ↑ Sciuridae Wikispecies. Web. Accessed April 12th, 2018. Last edited on January 3rd, 2018. Unknown Author. ↑ Squirrels National Geographic. web. Accessed April 28th, 2018. Author Unknown. ↑ Musser, Guy. Sciuridae Encyclopedia Britannica. Web. Accessed April 15th, 2018. ↑ 4.0 4.1 4.2 Brown, E.; A. Peri and N. Santarosa. Squirrels Animal Diversity Web. Web. Accessed April 15th, 2018. ↑ Bradford, Alina. Squirrels: Diet, Habits & Other Facts Live Science. Web. Published June 27th, 2014. ↑ Red Squirrel Role in the Ecosystem rosso scoiattolo. Web. Accessed April 28th, 2018. Author Unknown. ↑ Flying Squirrels The National Wildlife Federation. web. Accessed 28th April, 2018. Author Unknown. This page was last modified on 4 June 2018, at 11:31.